Yes, mice definitely prefer to live in the attics of homes. 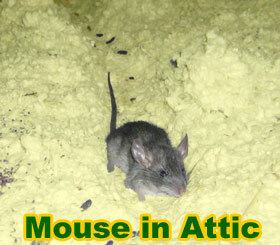 An attic is perfect shelter for the house mouse - a warm, safe, dry place in which to live and create a nest of baby mice. But there are several problems that come with mice. First of all, they breed prolifically. Just one pair of mice can result in hundreds of mice in a year. Your home or attic can become infested with mice if they have enough resources. Like all rodents, the House Mouse is a chewer, and it can chew on electrical wires, which can cause outages or a fire risk. The mouse can also chew on PVC piping. They also spread disease and can enter the house and contaminate food. If you don't take care of the problem, you can end up with considerable damage in your attic or home, such as seen in the below photographs. To prevent this, follow the five steps that I've outlined below. This work can be very difficult for beginners. It took me over a year, and several dozen mouse removal jobs, before I started to really get the hang of it, so if you're having trouble doing it yourself, you may want to hire a professional off of my directory to help you. Don't wait too long, because a mouse problem only gets worse with time. And please, under no circumstances should you use poison to try to get rid of mice in the attic. It will only kill a few mice, and the rest will keep going, but the mice that the poison does kill will rot and stink, and you'd be amazed at how this small animal can create such a big odor! Trapping and removal, as discussed below, is the far better option. FIRST: Inspect your entire house or building, and find all the open holes and gaps that mice are using to get into the structure. This can include vents, eave gaps, roof lines, etc. Check from the ground up, and definitely the entire roof. You need to look for VERY SMALL areas, like a quarter of an inch, or a hole the size of a dime. It takes great attention to detail. You can use a blacklight to see the mouse urine at night, which can help you find popular entry points. Once inside, a mouse can scurry though any part of the architecture, the walls, the ceiling, and get into the attic, where they like to live and nest. SECOND: Seal up all of these entry holes, using steel, which mice can't chew through. I bolt the steel in place. Use a sealant to block off all air flow, and to discourage mice from trying to get inside (they can smell air coming through a gap). This is an essential part of the mouse removal from the attic process. THIRD: Only AFTER everything is sealed should you bother to trap and remove the mice. Set mouse snap traps. They are definitely the best type of trap to use - on the mouse runways in the attic. Mice are pretty fearless, and easy to trap. If the numbers are really high, you can use a repeating trap, like the Tin Cat, but I like to use a lot of snap traps for mice. FOURTH: Remove the trapped mice until you hear no more sounds in the walls or attic. That's how you know all the mice are gone from the house. FIFTH: Clean up the crawl space afterward. You want to remove all of the droppings. Click here for photographs of mouse poop so that you can identify it. Learn more about the attic cleanup process, including methods and products, in my attic cleanup page. Go to my mouse removal page for more info on how to solve the problem. My Response: Yes, barrel tile roofs cause the biggest problems. It can be very challenging to solve. Simply put, you need a good expert with tile roof experience, to find the openings. Where do you live? Customer Mouse Email: I do not know your name, but I figured I'd ask for your help. Some pest control trappers I hired came to my house and sealed it from the mouse problem we were having in the attic. The bill was $400. It was not successful. He returned and sealed a few more places with foam. Again, the problem persisted. I put out poisoned bait...my mistake...and had to hire the trapper again to find the dead animal in the rafters. He was not successful, but the bill was still $160. I have called a few times to try to get someone to come out and re-inspect the house as the pests are still getting in somewhere. His website says he guarantees his work, ("We offer repairs of animal entry points and animal waste cleanup and we guarantee our work") but I cannot get anyone to come out and finish the job. I have been told that if hire independent contractors and the original pest control company no longer works, that I will have to pay again to have someone come out. That is unfortunate, but not my problem. A guarantee is a guarantee and I want someone to come out and finish the job or I want my $400 returned so I can hire another company. I do not want to have to contact my brother, an attorney who deals with fraud, but I feel I am being left with no choice. As I sit here at my computer I can hear something crawling in the walls. I want the problem fixed, as per his guarantee. Please contact me as soon as possible so we can resolve this matter. I just want the problem fixed. Thank you. My Response: That's really unfortunate! What a bad company you must have hired. Any company that offers a guarantee should honor it. Also, I wouldn't charge a customer if I was unable to find the dead animal. I'm sorry you had a bad experience with a pest control company. I don't know how I can specifically help unless I know the person you are talking about, but in the end it's up to that company to do good work and honor their guarantee. As for me, I do my best to provide educational materials online, and I try to refer good companies myself, but I can't be responsible for the actions of any other company other than mine in Orlando. Customer Mouse Email: to whom it may concern: my name is shawn I have a mouse problem in my attic or crawlspace and I work out of town so I cant control the problem. it has been going on to my knowledge for about a month maybe longer. I have a close by neighbor who has a key. I need an estimate of removal, and clean up (if you offer it.) Could you give an estimate as to approximate cost of eradicating the mouse? You may contact me by email. My Response: I'd be happy to help with your problem with a mouse in the attic. There are likely many mice. I will need to do an inspection in order to provide a proper estimate for the job, because I'll need to seal the house so that no more mice can get inside. For more information, you can go back to my main mouse removal page.